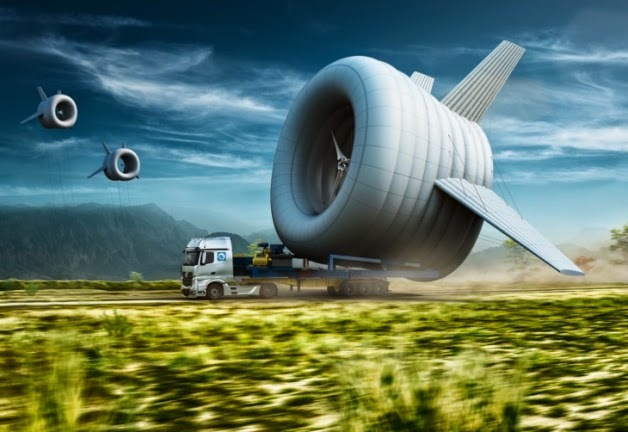 GIANT wind turbines that could be mistaken for alien spacecraft may soon be taking to the skies over Scotland to provide cheaper power for homes. The BAT – Buoyant Airborne Turbine – is designed to harness energy from stronger winds and produce more power than traditional turbines. Four prototypes have been developed and the first commercial product will be tested by American green energy firm Altaeros Energies in Alaska next year. The round helium-filled devices have been designed to float in the air and channel wind through the turbine and could generate electricity at a much lower cost for customers. Tethers are used to connect the shell to winches on the portable ground station and provide an electrical connection to send power from the turbine to the ground. The turbines are the result of an £800,000 study by entrepreneur Ben Glass and senior US military personnel. The firm is looking for remote locations and sees Scotland as a potential home for the turbines. Altaeros business development manager Ryan Holy said: “The real value is that we are generating more electricity because we are capturing stronger, more consistent resource, and that means that the price is going to be lower because the annual kWh produced will be a lot higher. “In addition to that, the customer doesn’t have to deal with a lot of the logistical headaches of installing a concrete path or a tower, which can take some time and might be dependent on seasons. The first commercial product to be tested in Alaska is expected to produce 30KW from a height of 1,000ft, with plans for a 100KW-plus turbine to follow. The lightweight horizontal axis design has been adapted from the traditional designs of turbines. NextPresident Obama: End Drone Strikes in Yemen!